If there was a burger that could legitimately be eaten for breakfast, this would be it. There's bacon and eggs, grass-fed beef and spinach leaves wilted in a little chopped garlic. 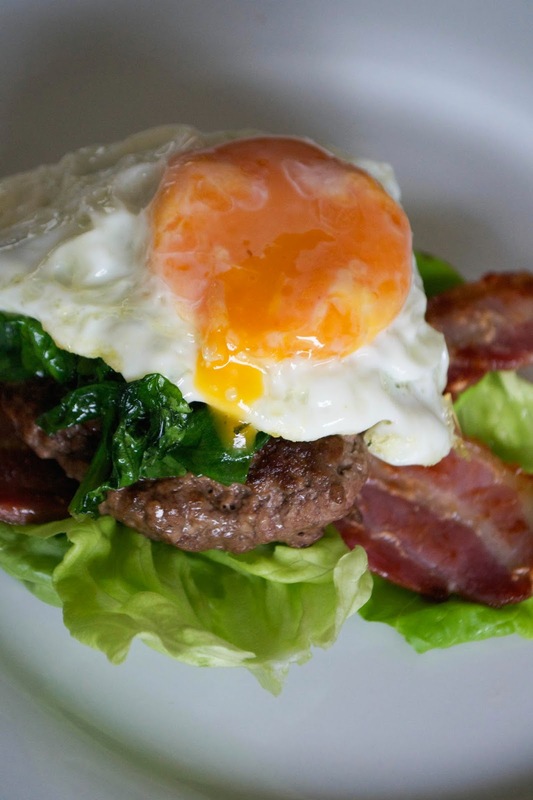 It all works together beautifully - the salty, smoky bacon; the rich beef; a soft tangle of earthy spinach leaves and then the silky yolk running down the lot. Made you hungry yet? Feel free to enjoy this in a bun if you want to - I just pile the whole thing up on a couple of little gem leaves for crunch instead. And it's autoimmune-friendly if you leave out the egg. First, fry the bacon in a dry pan, until crisp - lift it out of the pan and leave to one side. Finely chop the onion and fry in the bacon fat you have left in the pan (add a little more fat if you need it) with a pinch of salt. When the onion is soft, transfer to a bowl and allow to cool. Once cooled, add the minced beef and mix until just combined. Form into patties and then place into the now empty pan, to cook. Cook for around 5-6 minutes, or until fully cooked through so no pinkness remains. Next, dump the spinach leaves into the pan you cooked the burgers in, along with a chopped clove of garlic and a pinch of salt. It'll wilt down fairly quickly. In a separate pan, heat some fat and fry the eggs. Serve, piled up, in a bun or on lettuce leaves.